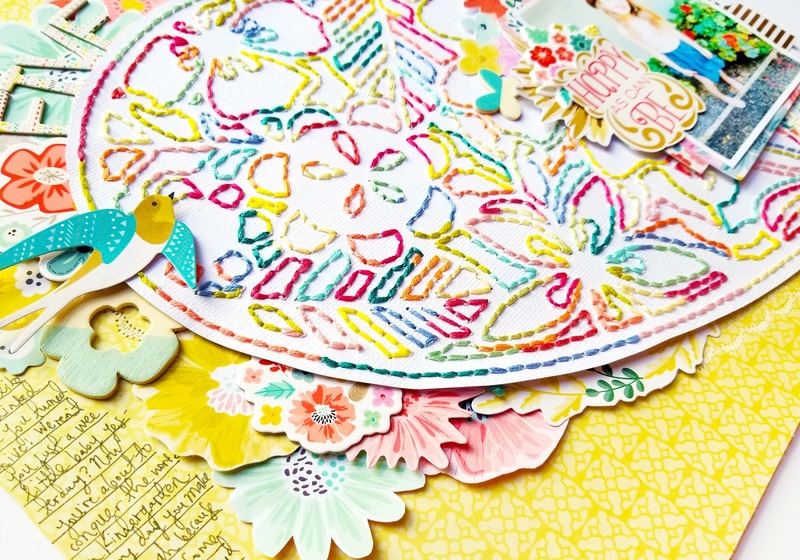 It all started with this beautiful floral heart cut file from Inna Moreva's etsy shop! Back in Germany as we were leaving to go on a road trip I prepared several cut files and projects to stitch. I didn't finish them all so I brought them with me back to the states. On our road trip to the Evans family reunion down in Oregon, I brought this one along! I debated long and hard about how to stitch it. I feel like I usually stitch in all white and then fill in the spaces with watercolors. Or I stitch all the individual shapes and elements in their natural colors (pink for flowers, green for leaves, etc.) I wanted to try something slightly different. And so, every 10 stitches, I changed colors of thread! It made the entire project take at least twice as long because I was stopping so often to switch colors, but I love it twice as much! I started by stitching the outside edge of the heart - it took 16 different colors to go all the way around and then I only used those colors to stitch the entire project. I didn't really have a color scheme in mind, I just used all my favorites! 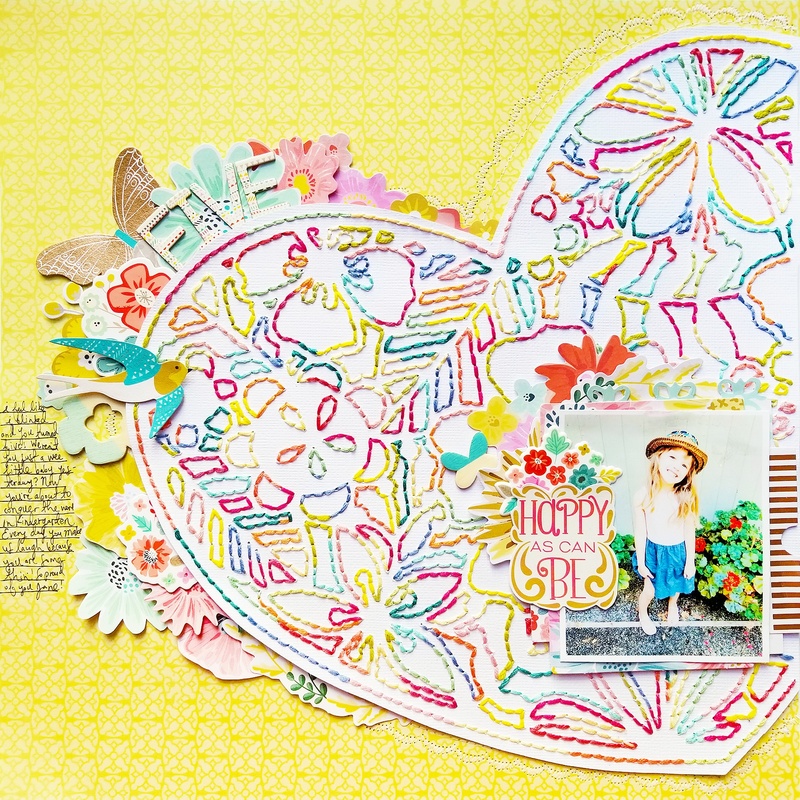 When it came time to turn the stitched heart into a layout, I was happy that Turn the Page matched so well! 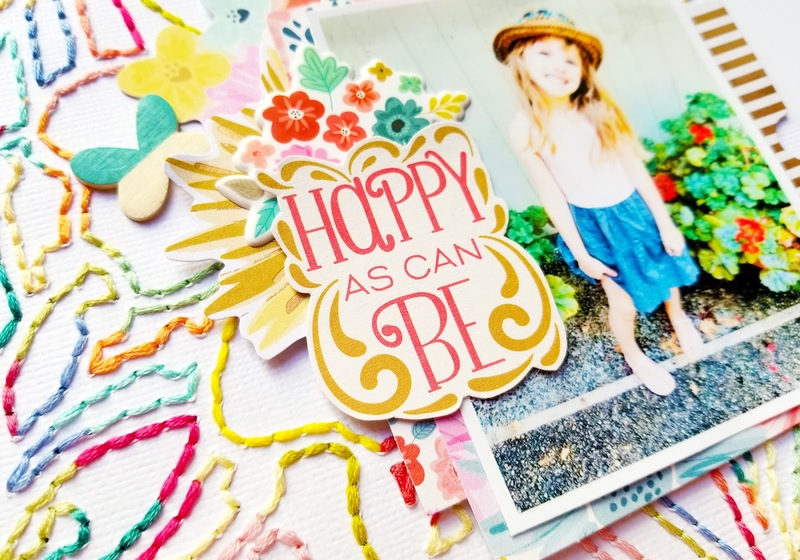 The "HAPPY AS CAN BE" sentiment actually came from the 2x2 Paper Pad and I loosely cut around it - I like how the curvy edges match the flourishes and what not of the stitching. There you go again, dropping my jaw on the floor!!! THIS is STUNNING! LOVING that adorable photo and love love love love that stitching!!!! GORGEOUS!!!!!!!!!!!!!! Such an amazing layout, Paige. 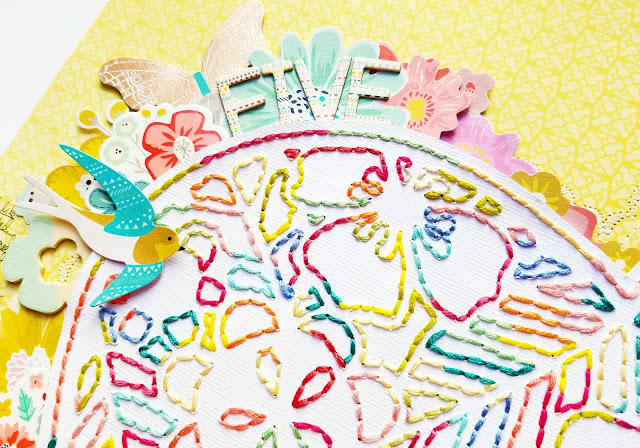 It showcases your incredible stitching and your adorably sweet, happy Jane in a lovely way! Exquisite! wow! love the embroidery stitching. i used to do so much embroidery when i was younger. i'm inspired to put some thread on my pages now. thanx for sharing such a gorgeous page.